Leela Samson, a former student of Kalakshetra who had the privilege of studying directly under Rukmini Devi, is one of India’s best-known Bharata Natyam dancers. She taught for some years at Kalakshetra and toured all over the world as a member of its dance troupe. 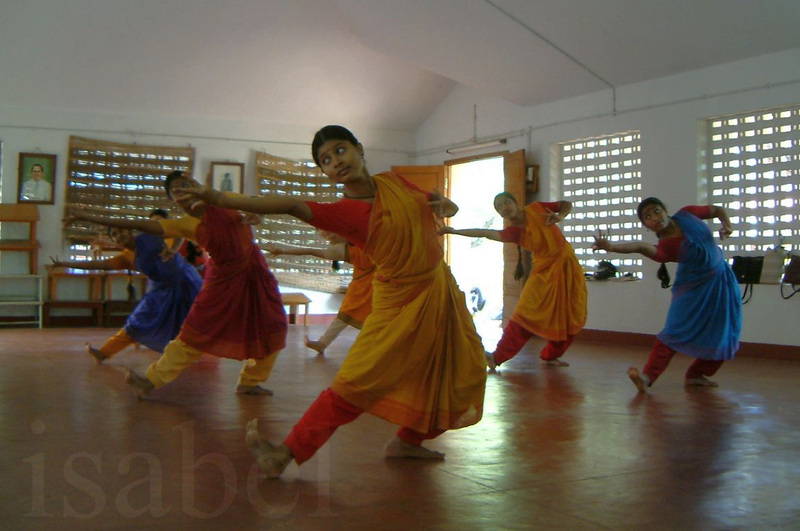 She is also a respected teacher, choreographer and writer. I had the opportunity to meet with her following her recent performance in London, England. We had arranged to meet the next morning at the Bharatiya Vidya Bhavan where she was conducting a month-long workshop with a group of young British dancers. As we arranged our chairs in a corner of the dance studio and I tested my recorder, she admitted that she never sleeps very much after a performance because of all the energy and excitement she feels after a show. She didn’t show any signs of fatigue, but seemed rather composed and cheerful. The traces of alta still fresh on her hands were the only remnants of her performance at the Queen Elizabeth Hall the night before. Although the Indian government has offered her land and asked her to start a dance institution in Delhi, Leela prefers to teach privately. She decided at the beginning of her career that she didn’t want her artistic time to be eaten up by all administrative matters running a school entails. She believes that all you need to create beautiful dancers is a small space, and feels she has proven this through all the professionals she has put into the field. She keeps her classes small and only takes a few children as students from when they’re six or seven years of age, and keeps them right through their schooling. This article was published in the Spring 2004 issue of Kala Arts Quarterly. Photo of Leela Samson by P. Ravindran courtesy The Hindu. 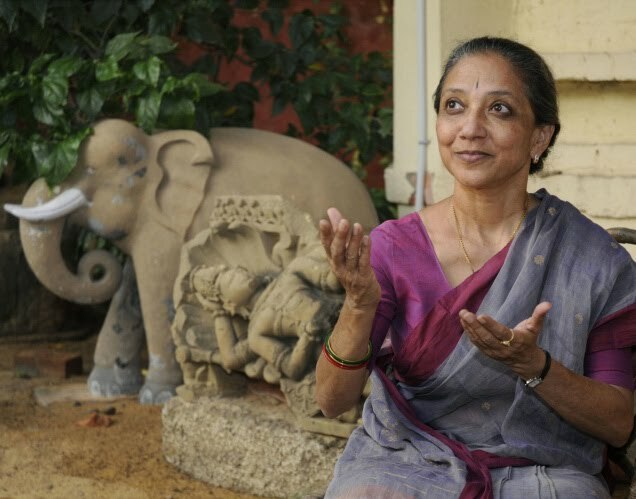 Since this interview, Leela Samson went on to become Director of Kalakshetra in 2005. 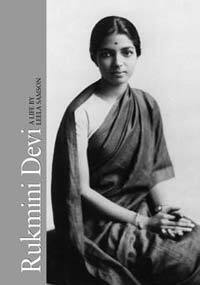 Rukmini Devi – A Life, her biography of her guru and the founder of Kalakshetra, was published at the beginning of 2010. She was recently appointed chairperson of the Sangeet Natak Akademi. Visit the Kalakshetra website here. 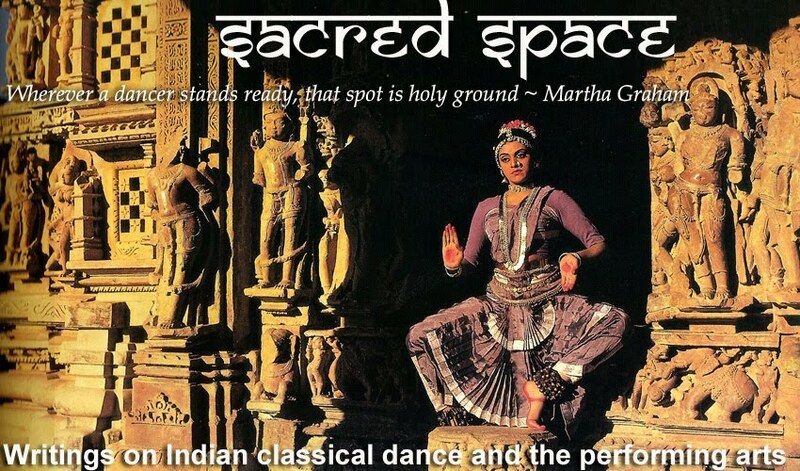 I disagree with Leela Samson that bharatanatyam doesn't speak religion. It does- Hinduisim , so do all dance forms of India. Not giving credit to Hindusim is like stealing.Movie company give credit to the original movie maker when they copy their movie. We are talking about the heritage of a country here. Hi Shiva, thanks for visiting Sacred Space. She doesn't say that 'Bharatanatyam doesn't speak a religion' but she does refer to 'dance' more generally by saying that 'dance doesn't speak a religion'. My understanding of her statement is that dance goes over and beyond religion and can speak to everyone, regardless of their religion. Of course bharatanatyam is a Hindu dance, no doubt about that! Her reflection is more of a philosophical one. thanks for replying.After living in America for 15 years I have seen Yoga being completely stripped of it's Hindu identity.I don't want to see Bharatanatyam or anything Indian being stripped of it's roots to get more people to accept it or follow it.And I would apply the same principle to all dance forms of all countries. Coming to Leela Samson's lament that Brahmins dominated the dances lacks credibility and shows a false sense of victim hood. Until Rukmini Devi-a Brahmin came to the dance scene, the dancers were Devadasis, who weren't Brahmin. Hi Shiva/Deepa, Thanks again for stopping by. If you read the text carefully, you will see that she does not 'lament that Brahmins dominated the dances'. The text says - and this is not a quote by her - 'Leela belongs to a minority practicing an art form which has become dominated by Brahmins'. This statement is in the present and not the past. thanks for this interview. i recently had the chance to meet ms.samson and was genuinely struck by her integrity and humility. you have portrayed her well, although too briefly, and thanks for clarifying after the mu(e)ddling comments...they seem reactive, myopic and purposefully ignorant...sorry have to say it. it seems that there is a particular brand of beings that are so bilious and are keen to take down anything that is authentic. Fake People like Shiva / Deepa are around the world. They take the first opportunity to leave India for greener pastures and then start complaining about all this. This fake person who is very concerned about Indian culture will never come back to India. People like this have not right to speak on Indian culture, when themselves did not have the courage to live in this country and be a part of it. PS - I don't have any problem in people leaving India, but big problem with those fake ones who will leave the country for good but keep preaching about Indian culture. Desi, it will be these Indians who leave our shores who do the most for us. If for any reason the US thinks highly of India, it is because of wave after wave of indians who have immigrated and created wonders in the US. It is definitely not due to sonia gandhi. Blame the system in India and not the people....blame the game, not the player. If your idea of patriotism is to allow the denigration of an art form, then I consider the person sitting 4000km away more patriotic.. Thank you heart flower. It is true that the portrait is all too brief to do justice to Leela. I hope she plans to write her autobiography sometime soon. Hi Desi, I'm not sure what Shiva was getting it. Few people take the time to do a careful reading. Perhaps is a problem of the blogosphere. Ms. Samson is sponsoring an orphan boy in his studies at Madras Christian College. Recently she had visited MCC to get him hostel accommodation.She stood like an ordinary person in the queue, waited for her turn and met the concerned authorities. For a great personality like her, she would had done it over a telephone call. Her interest in supporting a deserving poor student and her SIMPLICITY is awesome. As mentioned by heart flower earlier in his/her comments, her genuineness, integrity and simplicity is an outstanding example to humanity.